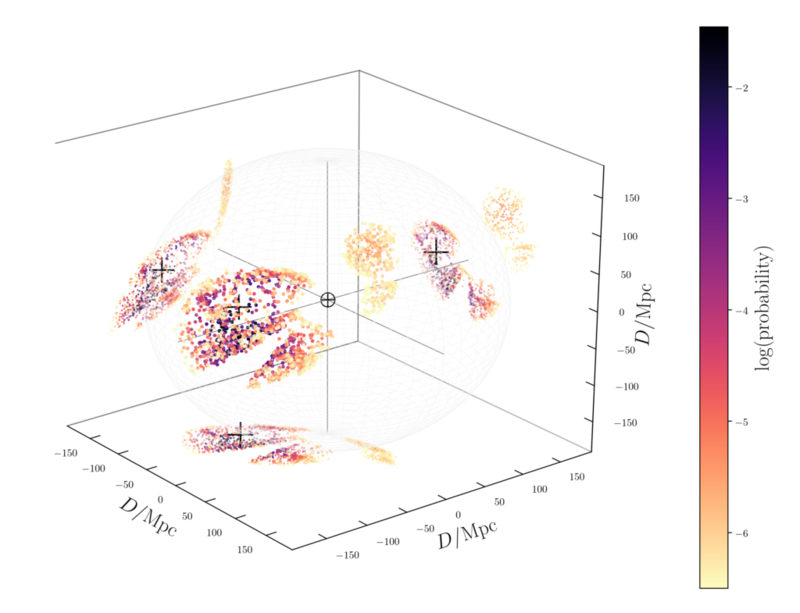 This image shows the most probable source galaxies for a simulated gravitational-wave signal from a binary neutron star system. Accurately identifying the source of gravitational waves is extremely important for directing follow-up observations with telescopes, and for measuring the expansion of the Universe. In Del Pozzo, Berry, Ghosh, Haines, Singer & Vecchio (2018; http://adsabs.harvard.edu/abs/2018MNRAS.479..601D) we applied a Dirichlet process Gaussian mixture model (a statistical technique used in computer vision) to reconstructing three-dimensional localizations of gravitational-wave signals. This approach can rapidly and accurately construct the most probable source locations. Our results highlighted how widely localizations can vary between events: on average, an signal twice as loud will be localized to a volume 64 times smaller. It is much easier to follow-up the loudest events!